Technology has evolved with time. The old trends are lost. The new ones are here to takeover. As the old technology trends, do not address the growing needs of companies, therefore, it is important for enterprises to incorporate the newest trends for gaining a competitive edge, improving agility and productivity. Enterprise apps have been an integral part of every company’s digital strategy as the mobile app development company Algoworks has learnt. Such applications have enabled digitization of data which has eliminated the need for endless paperwork. Also, it has made data access simpler. 2017 will observe a lot of changes in enterprise app development. This will be all about new tools and technologies, better libraries and development styles. Enterprise app development is more focused towards making processes more efficient and enterprises more productive. 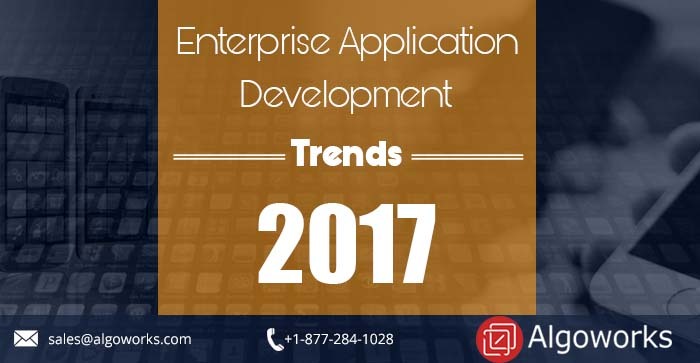 Let us have a look at some of the enterprise application development trends that will be focused upon in 2017. We are in a digital age and you will see that there is an increase of cyber-attacks which leave no traces behind and causes the downfall of companies. There have been times that while developing a mobile app many developers may forget the whole security aspect. Of course, these mobile app developers understand the risks associated with security of an app but such things are taken into account only after the entire mobile application has been developed. This is the reason for several vulnerabilities within the app. The study reveals since last few years close to 86% of the mobile applications have experienced serious issues regarding authentication, confidentiality and access control. Among this 52% have exposure to issues like cross-site scripting, SQL injection and much more. These are popular but can be controlled. Such problems cause a major breach in security which can definitely be avoided. Of course, mobile app security is one of the trends which will be popular in the year 2017 in the enterprise app development domain. This will allow mobile app developers to take security seriously and businesses will strive for finishing the security gaps, therefore, incredible customer experience. For enterprise apps, responsive design is no longer a want but a need. Also, the adaptive interfaces which do not compromise on experience seem to be dragged down by Google too. Instead, responsiveness should be an inbuilt feature that would be part of web development project. The study reveals that Google is giving the special responsive badge to websites and web applications which are responsive. Google is even offering higher SEO page ranks as encouragement. It was sometime back when responsive design was a hot trend. Also, the same design can be easily adaptable to different screen sizes. Adaptability to various screen sizes will remain in popularity but responsive web design might loose the impact. More than responsiveness, the adaptability of the screens to various devices holds great importance. Data Management has become a serious challenge for enterprises as the types of data and the speed at which it arrives increases persistently. Enterprises are learning to use data which is helping them in improving operations and customer service. This makes them rely more and more on mobile apps for delivering timely information to customers and empowering employees with real-time access to data through mobile devices to make quick and informed decisions. Mobile apps will be key to how well the enterprises manages and leverages its data. The apps need to be fluid and mobile to be accessible on different devices, both desktop, and mobile. For giving user uniformed experience across multiple platforms, data storage holds great importance. Here comes the relevance of cloud storage sync which will ensure easy access to real-time data across devices as all data is stored in one repository. The world which is flattened by technology helps business to carry beyond territories. 2017 will be witnessing much of mobile cloud adoption and cloud-based application. More and more apps will be increasingly developed, delivered and managed on cloud platforms. Cloud brings flexibility to develop enterprise-class mobile apps for use of multiple devices. Cloud application development offers readily available tools and speeds up the process, therefore, shortening time to market and encouraging competitiveness. The app development went mushrooming with the growth of devices, screen sizes, and Operating Systems. This gave rise to adaptive and responsive design and application development strategy forever changed. With each passing year, we are observing ever-growing demand of a number of devices. Devices like wearables and connected things have different functions, different screen sizes and therefore generates different types of data. With new devices emerging, the need for modern development skills arise. Even new technologies will drive the need for different skills. Therefore, with the ever-growing demand for devices and technologies, there is a subsequent rise for different skills. It seems for few years we have just been talking about NoSQL databases like MongoDB and Cassandra. Of course, the flexible data modelling and scale-out merits of these new solutions are just amazing but SQL has also learned to scale out as well. With products like ClustrixDB, DeepSQL and VoltDB users can simply add commodity nodes instead of bulking up a database server. Along with this NoSQL, databases are bending over backward to offer SQL interoperability. The reality is that if you have a lot of data and you want to able to analyse it, the popular analytics tools will still demand SQL. NoSQL, of course, has crazy varieties and offers tremendous potential and even SQL shows no sign of fading. Tech gurus predict some grand unification of SQL and NoSQL. With the growing use of smartphones, there is an increased growth of enterprise mobile apps. The demand of these enterprise applications will increase exponentially in 2017. This also explains that there will be the need of mobile apps that will adapt to every device and can be operated across different Operating Systems. Also, this will give rise to hybrid enterprise apps which can give you access to different operating systems, therefore, ensuring native-like experience. Hybrid app development will not just reduce the costs but also increase the productivity of application development. As most of the companies have adopted BYOD policy for reducing overhead costs, hybrid web and mobile application development becomes more relevant. Hybrid app development also facilitates cost control and ensures rapid development as simultaneous development process happens for multiple platforms on a single platform. 2017 promises to be a wonderful year for mobile app development. This year companies will realize that they can no longer live without a mobile app development strategy. With more and more companies exploring new technologies like machine learning, Virtual/Augmented Reality or Artificial Intelligence there will be a corresponding demand for proficient mobile app developers that can develop code to support them.